Why do people expect each other (and themselves) to be saintlike in the face of abuse and oppression? When I was growing up, I never saw any media that talked about ways to deal with abuse. Sometimes there might be a horror story about an abuse case on the news, but there was nothing about how to handle the experience yourself. The only example I had was the story of Cinderella. Cinderella’s widowed father takes a new wife. Her father tragically dies, and the stepmother and her daughters make Cinderella’s life a living hell. She’s forced to do chores until she’s exhausted, and none of them help her. She’s given ragged clothes to wear while they wear the finest clothes money can buy. She’s made to feel like she’s not a real part of the family. However, Cinderella doesn’t let that make her a mean person. She’s the exact opposite of mean, in fact. She does her chores without complaint, and she talks to the little mice and birds she meets while doing them. She’s one of the kindest damn people you’ll ever meet, even though her stepfamily is so nasty to her. She also looks prettier than her stepsisters, even though she’s dressed in rags and they’re wearing beautiful clothes. Cinderella is rewarded for her kindness, without ever raising a complaint or telling someone outside of her family about the situation. One day her stepmother tells her that she can go to the prince’s ball with them if she does even more chores than usual. Cinderella scrubs the house spotless, and then the stepmother is basically like, “LOL, you thought I was serious?” Her stepfamily leaves for the ball without her. Cinderella cries, and all of a sudden, her fairy godmother appears to save the day. A pumpkin gets turned into a carriage, her mice friends get turned into horses to take her to the ball, and the prince falls in love with her beauty. She ends up marrying him and living happily ever after. The “happily ever after” part is where things get especially weird. I’ve seen some versions that said that at the end, Cinderella forgives her family and allows them to live in the prince’s castle with her. What a happy ending, right? I mean, I know I’d love to live with my abusive family for the rest of my life and provide them with a beautiful, luxurious place to live after they tortured me for years. Sounds wonderful. This is the model that I know for dealing with abuse. Don’t complain. Just do what they tell you, especially if they’re family. Maybe if you’re nice enough, they’ll eventually realize how badly they’re treating you and stop. Even if they don’t, whenever you get out of the situation you should still keep them in your life and visit them and continue to be kind to them. Being mean to someone who’s hurt you is just as bad as what the other person did, right? I see similar attitudes when people complain about injustice or oppression. That’s what a lot of tone policing seems to boil down to. If you experience racism and say disparaging things about white people, you’re the real racist! If you say derogatory things about straight people after enduring homophobia for your entire life, that’s just as bad as being homophobic! If you make a movie with an all-female main cast in response to decades of all-male casts in movies, you’re pandering to feminists and being sexist against men! Sure, the discrimination you’ve been through is wrong, but you’re not bearing it gracefully enough. Someone yelled at you and called you a slur, and you snapped and yelled back at them. Yelling at someone and calling them names is wrong no matter who’s doing it. You should be nicer. Making movies that don’t accommodate a diverse amount of people is bad if you’re doing it too. How dare you make a movie that excludes men? That’s not the way you should be doing things. These naysayers never tell you how you actually should be doing things, though. They just tell you to stop taking action, stop raising a fuss, and just roll over and take it. Of course, no one who’s saying this kind of thing ever seems to turn around and say the same stuff to the person who’s abusing or harassing you. They don’t say that the other person never should have been treating you that way in the first place. They don’t tell non-inclusive creators to stop creating because their work doesn’t include everybody. They don’t start any petitions saying, “Hey, media giants, could y’all start making some more inclusive movies and TV shows?” They don’t do anything to help you. Presumably, you are supposed to grin and bear it peacefully and wait for some kind of social justice fairy godmother to come down from the sky and rescue you from oppression. Sometimes, the worst part of it for me is that I tone police myself. I think that I should continue to be kind to someone even when they’re mistreating me, because I don’t want to sink to their level, right? If someone hurts me and I hurt them back, doesn’t that make me just as bad as them? If someone discriminates against me and ruins my day, isn’t it just as bad if I ruin their day in turn? And honestly, I don’t always know what the answer is. I want to put as much positivity out into the world as possible, even when someone’s being terrible to me. And some vindictive part of me really loves the “killing them with kindness” move. I imagine that later, this person will cool off and realize what they did, and the fact that I was nice to them in the face of their rudeness will make them feel even worse. It seems like the best revenge possible to me. But I have no idea what the other person is going to be thinking later. Chances are that a person who doesn’t realize that it’s wrong to be abusive to someone, or even that they’re being abusive in the first place, isn’t going to be self-aware enough to realize their mistake. And it’s an incredibly toxic thing to tell someone that being angry and irrational in the face of abuse is just as bad as the abuse itself. If someone hits me and bruises me, I shouldn’t be expected to hide the injury and never seek treatment, even if the harm was accidental. If someone gives me an emotional bruise, I shouldn’t be expected to hide the signs of said bruise and never complain about it. And I definitely shouldn’t be told that I’m just as bad as the person who hurt me for talking about the bruise, even for allowing the bruise to exist. I don’t choose whether or not the bruise exists, after all. Someone put it there, and even if I did hide it, that wouldn’t make it go away. It would just mean that no one else had to look at it. And it took me way too damn long to realize that my problems won’t magically go away if I just don’t talk about them. How the hell would that work anyway? The squeaky wheel gets the grease, right? Nobody should have to be on constant lookout to see if I need anything from them. Nobody should have to be my fairy godmother. None of us are fairy godmothers in the first place. We’re all just people doing what we can, and sometimes we don’t have the energy to notice all on our own that someone’s struggling and they need our help. We have to tell people about our problems if we want help. We have to protest our oppression and ask for aid from privileged folks if we want it to stop. And it’s cruel for privileged people to tell marginalized people that if only they could be a little less angry and a little more polite, people would be listening to them. This is especially true when they do absolutely nothing to help the cause themselves, just criticize people who are trying the best they can to save themselves and people like them. I don’t have an easy solution for this problem, this Cinderella ideal that’s incredibly pervasive in our society. The more I learn about our culture, the more I see how insidiously abuse is encoded into the ways we do things, whether on an interpersonal level or a systemic level. But I think we can start by working on incorporating a new Cinderella ideal, one that doesn’t cause us to blame others for their struggles or ourselves for the trauma we go through. There’s one Cinderella story out there that provides a great model. When I was a kid, I read a lot of mythology and folklore, and all of the toxic Cinderella stories I read overpowered the one healthy Cinderella story I saw. 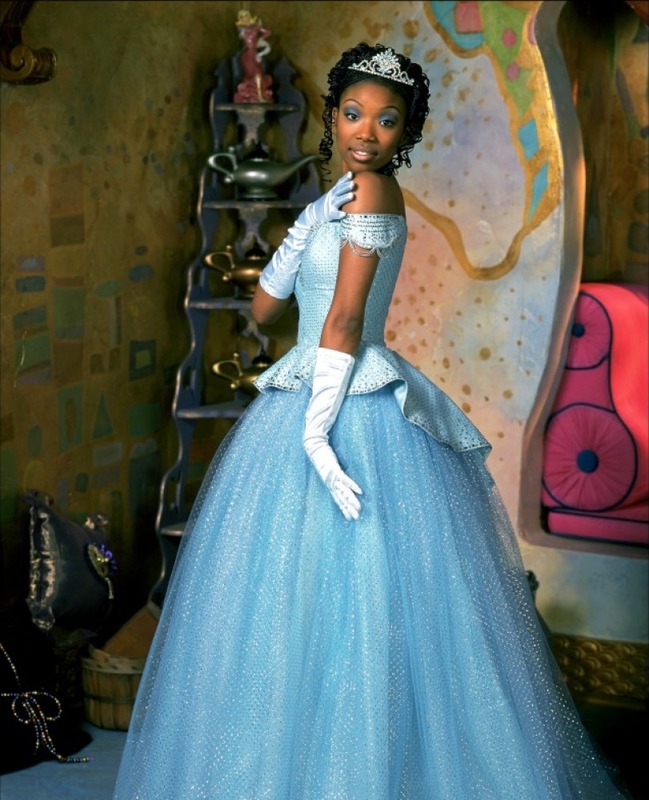 This story was the 1997 made-for-TV version of Rodgers and Hammerstein’s Cinderella, starring Brandy as Cinderella and Whitney Houston as the Fairy Godmother. The story doesn’t depart from its roots too much; Cinderella is orphaned and made to live with her cruel stepfamily, and she eventually escapes to marry and live with the prince. However, the way she gets there is incredibly different. When Cinderella’s fairy godmother appears to her, she tells Cinderella that it’s not good enough for her to sit alone in the kitchen with her mice friends and wish for her life to be better. She has to go out and make stuff happen. But Cinderella has no way to get to the ball, and the Godmother thinks there’s absolutely nothing wrong with getting help in a situation like that. So she gives her the pumpkin carriage and the mice-horses and one of the prettiest dresses you’ll ever see, and Cinderella rides to the prince’s palace. She has an amazing time, and she and the prince fall head over heels for each other. After going to the ball, Cinderella realizes how much better the outside world is than her home, and she thinks about leaving her stepfamily. But she feels guilty for even considering it; after all, her father wanted the family to stay together. But the Godmother tells her, “This can’t be what your father had in mind.” By the time the prince arrives at Cinderella’s stepfamily’s house in the hopes of finding her again, she’s decided to leave. It’s pure luck that he happens to find her before she disappears for good. If he hadn’t arrived just in time, Cinderella would have left without him to make her own way in life. She probably would have missed the prince, but she would’ve survived. She never needed him to rescue her. During the closing scene of the movie, Whitney Houston sings triumphantly in the sky with all the splendor of ‘90s CGI* as Cinderella and the prince ride into the palace. The golden gates of the palace shut on Cinderella’s stepfamily as they attempt to scale the gates and vainly scream, “Wait!” and “We love you!” at her. They don’t matter anymore. She’s found her happiness and is never going to give them the time of day. The language is silly, but the underlying message is powerful. There are a lot of problems in the world that seem impossible to fix. When I’ve complained about them, people have told me that yeah, these things are terrible, but that’s just the way things are. What are we going to do about it, right? Well, it turns out there’s a lot we can do about it. And those of us who dream about a better world are the ones who are going to make it a reality, not the “sensible” people who sit on their asses and criticize what we’re doing and tell us how impossible our dreams are. So take it from Whitney Houston’s Fairy Godmother, folks: you do not have to stoically bear the problems you face in life. It is not your responsibility to stay kind and remain in a bad situation until it gets better. It’s important for you to make things happen in your life yourself, but it’s also important to ask for help. I don’t know if there’s a palace with golden gates waiting out there for any of us, but together we can build one. And once it’s built, we never have to allow our cruel stepfamilies in. *Sorry about the video quality here. It was the only clip I could find on YouTube.